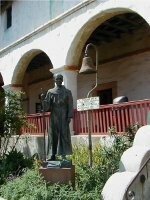 Santa Barbara Mission was founded December 4, 1786. 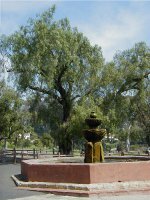 Portions of five units of its extensive waterworks, built by Indian labor and preserved in this part, are a filter house, Spanish gristmill, sections of aqueducts, and two reservoirs, the larger of which, built in 1806, is used today as part of the city water system. 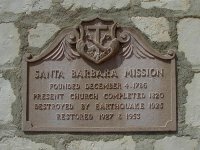 The fountain and lavadero are nearby, in front of the mission, and a dam built in 1807 is located in the Santa Barbara Botanic Garden, one and one-half miles up Mission Canyon. 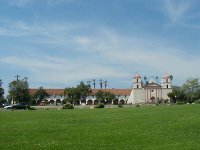 Only ruins remain of the mission's pottery kiln, guard house, and tanning vats. 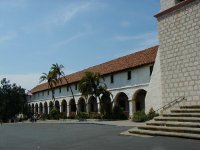 View of the front of the mission. 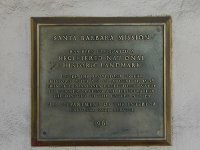 Small plaque in the mission wall.